Derek Pavis had the main stand at Meadow Lane named after him. Tributes have been paid to former Notts County chairman Derek Pavis who passed away at the age of 87. During his 13 years in charge, Pavis - who died on Friday following an illness - appointed both Neil Warnock and Sam Allardyce to the Meadow Lane dugout. Under Warnock, the Magpies achieved successive promotions to reach the old Division One in 1991. "What Derek achieved is quite extraordinary," BBC Radio Nottingham's Colin Slater told East Midlands Today. "His lasting legacy was the rebuilding of the Meadow Lane stadium to the standard that it is today. "The way that was achieved showed his care and love of Notts County, which over those 13 years he served so magnificently." Pavis took charge of the Magpies in June 1987 and stepped down 13 years later on his 70th birthday. He hired Warnock, then the 40-year-old manager of Scarborough, at the start of 1989 and County won back-to-back play-off finals at Wembley, beating Tranmere in 1990 and Brighton in 1991. The redevelopment of the ground saw three stands demolished in the 1992 close season, while the Main Stand was replaced in 1994 and named after Pavis. He appointed Allardyce in January 1997 and the future West Ham and Crystal Palace boss won 56 of his 145 matches in charge until he resigned in October 1999 to take over at Bolton. In 2005, Pavis had a takeover bid rejected by the club but he remained a regular visitor to Notts games until earlier this year when he became ill.
Current Magpies chairman and owner Alan Hardy told the club's website: "I can only aspire to get close to being the wonderful man Derek was - a visionary and an outstanding leader and chairman. 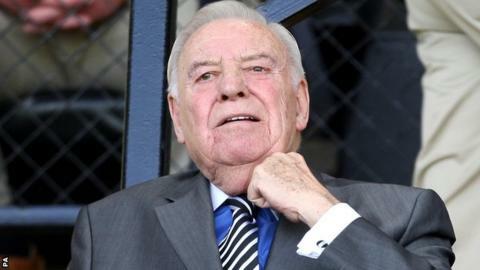 "He was a wonderful man and a tremendous servant of Notts County Football Club."